are suggested to apply online on or before 06-08-2018 for this UPPSC Upper Subordinate Services Recruitment Exam 2018. The common eligibility for all these jobs are a graduation from any recognized university in India. Online applications will be accepted through official website of UPPSC @www.uppsc.up.nic.in. The candidates have to pay the application fees through bank e challan on or before 02-08-2018. 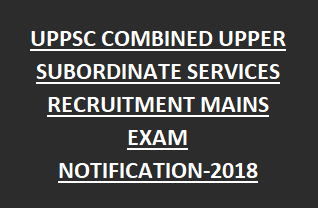 There are total 832 posts available in this UPPSC Combined Upper Subordinate Services Recruitment Exam 2018. For Complete information see the below given details for UPPSC PCS Recruitment Exam 2018. UPPSC Upper Subordinate Services Examination will be conducted in three different stages. Stage one a Preliminary test will be conducted. Stage 2 Mains Examination. The candidates who are qualified for the UPPSC Preliminary examination they are eligible to write the Mains examination. There is separate notification will be released for Mains examination. And the third stage is interview. The candidates who are qualified in Mains will be called for interview. And final selection will based on marks in Mains examination and interview. This examination fees is only valid for UPPSC Preliminary Examinations. There are total 832 vacancies available. Deputy Collector, Block Development Officer, Deputy Superintendent of Police, Assistant Regional Transport Officer, District Commandant Homeguards, Assistant Commissioner (Commercial Tax), Treasury Officer/Accounts Officer (Treasury), Superintendent Jail, Cane Inspector and Assistant Sugar Commissioner, Manager Credit (Small Industries), Executive Officer Grade-I/Assistant Nagar Ayukta, Manager Marketing and Economic Survey (Small Industries), District Basic Education Officer/Associate DIOS & other equivalent Administrative Posts, Assistant Labour Commissioner, Assistant Director Industries (Marketing), Senior Lecturer DIET, Assistant Commissioner Industries, Designated Officer, Statistical Officer, (Treasury) Commercial Tax Officer, Assistant Accounts Officer, District Minority Welfare Officer, Executive Officer (Panchayati Raj), District Food Marketing Officer, Deputy Secretary (Housing and Urban Planning), District Backward Welfare Officer, Area Rationing Officer, Naib Tehsildar, District Panchayat Raj Officer, District Saving Officer, District Social Welfare Officer, Accounts Officer (Nagar Vikas), Executive Officer (Nagar Vikas), Additional District Development Officer (Social Welfare), District Supply Officer Grade-2, District Handicapped Welfare Officer, Passenger/Goods Tax Officer, Assistant Employment Officer, Regional Employment Officer, Accounts Officer (Local Bodies), Assistant Registrar (Cooperative), Assistant Prosecuting Officer (Transport), Sub Registrar, District Probation Officer, District Horticulture Officer Grade-1 and Superintendent Govt. Garden, District Horticulture Officer Grade-2, District Horticulture Officer, U.P. Agriculture Service Group-”B” (Development Branch), District Cane Officer, District Administrative Officer, Assistant Controller Legal Measurement (Grade-1), District Audit Officer (Revenue Audit), District Programme Officer, District Youth Welfare and Pradeshik Vikas Dal Officer. The application fees for the candidates of General and OBC Rs.100/- and Rs.25/- for online application process. For SC/ST/PWD candidates is Rs.40/- and Rs. 25/- for Online application fees. The candidate has to apply online through the official website of UPPSC @uppsc.up.gov.in. Application has to apply through online only. Before applying online candidate must have to read the user instructions, Official notification UPPSC Upper Subordinate Services Recruitment and then go for apply online. After filling the first stage of basic registration of candidate has to click on the submit button. From then second stage will begun which consist of application fee thorough I collect or E challana. The candidates who are having internet banking with State Bank of India or Punjab National Bank they can pay instantly through I collect, for other candidates they have to take the printout of E challana and pay the amount on or before 06-08-2018 in the respective banks which are said above for I collect. After payment process candidate has to enter the necessary data online and has to submit the application online before 06-08-2018. As on 01-07-2018 candidate upper age limit is 21 years and lower age limit is 40 years. For BC/SC/ST candidates age limits are 45 years and for PWD candidate's age limits are 55 years. For educational qualifications candidates are suggested to see the original notification of UPPSC Upper Subordinated Services Examination 2018. This is all about the UPPSC Combined Upper Subordinate Services recruitment examination. Please share this information to with your friends through the social networking sites and help them to get a good job.